The expression once a police officer, always a police officer resonates with Senior Global Cyber Security Manager Brian M.
After spending 20 years in law enforcement — first as a police officer in Chesterfield, Missouri, and then as part of the FBI’s cyber squad — Brian now runs cyber operations at Enterprise Holdings. Regardless of the cyberspace he’s patrolling, his respect for the police force led to an Enterprise Holdings Foundation grant to benefit an injured local officer. Within a few days, word spread of the bike ride and two more Global Cyber Security managers asked to join. The newly formed team — Brian, Bill, Senior Cyber Incident Response Manager David H. and Senior Offensive Security Manager Alan P. — began training together after work. During one ride, Brian mentioned the only thing he regretted about his first Katy Trail adventure was not doing it for a cause. That’s when the group decided to do the ride for themselves, but make their accomplishment part of something larger. As the group began to search for a local cause with a nationwide impact, Brian brought to his peers’ attention the incredible need for resources for officers critically injured in the line of duty. 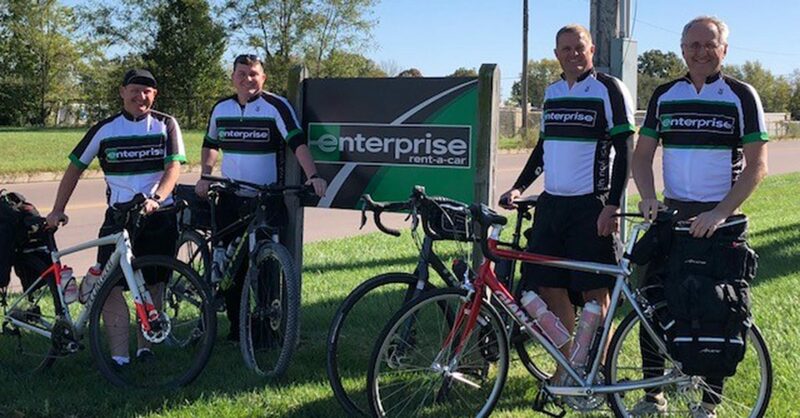 The four cyclists loaded up two Enterprise rental vans and headed toward Clinton, Missouri, to start their journey on the Katy Trail. Even though they haven’t officially passed the finish line yet, Brian requested and received a grant for the Gary Sinise Foundation from the Enterprise Holdings Foundation — the company’s philanthropic arm that donated $36.5 million in FY2017 to charitable causes on behalf of employees.